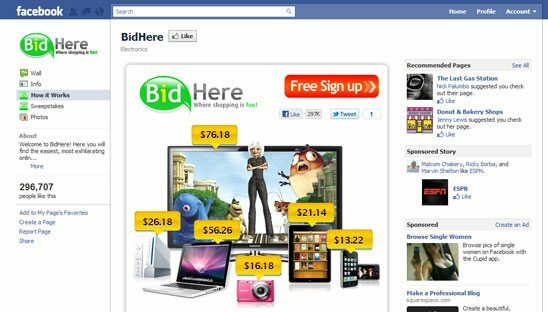 BidHere is a unique online penny auction experience where brand new electronics, jewelery, watches and accessories fall under the auction hammer everyday and sell for prices that can only be described as totally insane. BidHere hired us to design two custom iframe facebook tabs. 1st tab is the ‘welcome tab’, which consist of instructions on how to use the website, video, auction examples and more. 2nd tab consist of the Sweepstakes sign up form to win a FREE iPad 2.